Time to celebrate Eucerin's newest product, Professional Repair Lotion for extremely dry skin, the newest hottest thing in moisturizer! 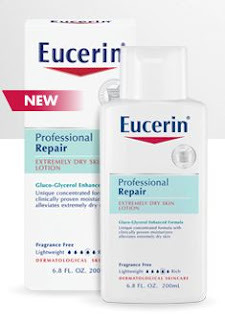 If you thought the original Eucerin Lotion worked great, the Professional Repair will blow your mind. It feels like silk on my skin, and has been amazing for my rosacea and dry skin issues, especially with the weather changing. Based upon more than 111 years of Eucerin’s skincare expertise and innovation, Professional Repair’s advanced formula sets a new standard for moisturization. It features a groundbreaking technology that combines skin’s own natural moisturizers and Ceramide-3, a component of a healthy skin barrier, with Gluco-Glycerol, an innovative moisturizer—to improve the condition of skin and fight extreme dryness. Alleviate and Repair extremely dry skin with a unique concentrated formula with clinically proven moisturizers. To purchase Eucerin's Professional Repair visit a drugstore near you, and visit EucerinUS.com for more information on all their products. To celebrate the newest innovation in skin care, Eucerin is giving one lucky winner the chance to win an amazing Eucerin Prize Pack which will include a 8 oz bottle of Eucerin Pro Repair, and a $125 Visa Gift Card! To enter, all you have to do is fill out the Rafflecopter below: Good luck! Thank you and I would love this prize! My sister raves about this product and I have found that as I have gotten older my skin gets drier and drier. I would love to get some relief from my dry skin. Wonderful!i would love to try it out.Who knows i could help with marketing and direct sales. I would love to try this, I have very dry skin.. I would to try this for my dry skin. I so love Eucerin products I send to a friend in South Africa. Because she's on dialysis, her skin is sometimes "itchy" and the calming cream helps incredibly!! Love Eucerin products would love to win some as well!!!! !